Part of my longer term objective is to provide a comprehensive breakdown of who it is that we can trust? who has our interests at heart? who is selling us out for their thirty pieces of silver? who is the internal enemy? and who is the external enemy? In life, you’re either part of the problem, part of the solution or part of the scenery. So I’ve categorised organisations into three distinctions, these are based on my own observations, sometimes from monitoring their websites, press releases and media appearances, at other times from personal experience. I do not need to validate myself to anyone by way of explaining why I have put a certain group in a certain category, unless I’m in an exceptionally jovial mood. I have just come across your website. It is really good – especially the sell-out corner. BMSD and Quilliams are such big sell-outs that they should be listed twice! I think you should include UmmahPulse in your trustworthy corner – they have consistently spoken for Islam and against the sell-outs – especially since they had that huge run-in with BMSD about the BMSD’s dodgy school guidance document. You might consider adding Mike Ruppert to your trust worthy list. I have always found he speaks the truth. I appreciate your efforts in doing your part to further the interest of the muslims and Islam in general. All actions are judged according to intentions, and I pray that Allah(S.W.T.) help you in purifying your intentions and overlook your shortcomings and make you better in propagating islam and ultimately grant you Jannah. Please try to be clear in your posts between what’s your humble opinion and what is a religious fact and also try to include proofs when it comes to religious matters. May Allah give us all Idhaaya and Grant us respite in this world and in the hereafter. Love you fi’llah. N.B. -Don’t you think sites like “Islam-qa.com” should be included in your list of trusted sites?. what do you think? If you want to boycott Israel you should start getting used to live in the middle ages. Israel has a touch in every high tech, medicine, cellular, computing and software elements. You – muslim world have a big touch in explosives, rockets and blowing. This is the kind of arrogant, sneering and extremely ignorant attitude that creeps like a malignant cancer, destroying the good work carried out by good people who genuinely care about ALL of humankind. Yoav, you should hang your head in shame. Your comments seem to mirror the approach of the Israeli government towards the occupied territories, the illegal settlements and it’s contempt of the Palestinian people. Btw, I am British, of Anglo-Saxon heritage and caucasian. I am just fed up with all the people who don’t carry a good heart through the day. If we all did so, then a co-ordinated resolution to all humanity’s problems would be a fraction more possible. How can you not have Noam Chomsky on your “trust” list? Also Mark Curtis and Naomi Klein are excellent, as is Robert Fisk. Otherwise (religion stuff aside), this site is a decent resource – i’ve just discovered the Bureau of investigative journalism as a result of an article f yours, so thanks. I would certainly add Henry Makow on your trusted site. He is an excellent writer against feminism and the New World Order. Recommended. I would add alanhart.net to trustworthy sites. He has been a long standing champion of the Palestinian cause and is outspoken in his opinions on zionist crimes. While I think boycotting Israel is definitely not a bad idea, it doesn’t get to the root of the problem. The Zionist entity wouldn’t exist without the billions of dollars in open and hidden financial and military help by the United States and their consistent abuse of the Security Council veto. If you want to be effective you have to take on those individuals and corporations that support IsraHell. "Truth stands out clear from Error: whoever rejects evil & believes in Allah has grasped the most trustworthy hand-hold that never breaks. And Allah hears & knows all things." Why did a US CIA drone kill Taliban leader days before peace talks? What were the SAS doing in the Westgate shopping mall in Nairobi? What exactly is Jihad for a British Muslim in these corrupt times? Show Israel the Red Card – Kick Israeli racism out of UEFA! * The Sealed Nectar - Ar-Raheeq Al-Makhtum. * Muhammad: As a Military Leader. * The rare and excellent history of Saladin, or, al-Nawādir al-Sulṭāniyya waʾl-Maḥāsin al-Yūsufiyya. * Islam in Britain, 1558-1685. * Imam Shamil The First Muslim Guerilla Leader. * Manufacturing consent : the political economy of the mass media. * Unspeak : words are weapons. * The bear trap : Afghanistan's untold story. * Soldiers of God: Islamic Warriors in Afghanistan & Pakistan. 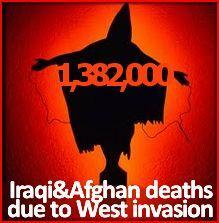 * Unholy wars : Afghanistan, America & international terrorism. * Bad news from Israel. * Image and reality : the Israel-Palestine conflict. * American dream, global nightmare. * The Israel Lobby & US Foreign Policy. * The Holocaust Industry: Reflections on the Exploitation of Jewish Suffering. * The Ethnic Cleansing of Palestine. * The Politics of Anti-Semitism. * McMafia : crime without frontiers. * Confessions of an economic hit man. * Safe area Goražde: The War in Bosnia 1992-1995. * Palestine forward by Edward Said. * Pride of Baghdad : inspired by a true story. * Islam, the West & the challenges of modernity. * iMuslims - Rewiring the house of Islam. * Churchill and the Jews. * The Jews of Britain, 1656 to 2000. * Weimar and the rise of Nazi Germany 1918-1933. * The Invention of the Jewish People. * The Middle East since 1914. * Warrior Politics: Why Leadership Demands a Pagan Ethos. * Clausewitz in the Twenty-First Century. * Energy Security and Global Politics. * The State of the World Atlas. * Warrior of the Light: A Manual.